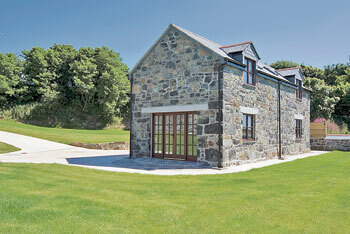 This two bed newly renovated stone barn is situated in the Lizard Peninsula in Cornwall. it is accessed by a no through country lane and is surrounded by its own quarter of an acre patio and lawns. Overlooking farmland with distant sea views and in an Area of Outstanding Natural Beauty, it is a tranquil haven for walkers and nature lovers. The village shop and pub are about 1 mile by car – or a ½ mile walk across fields. 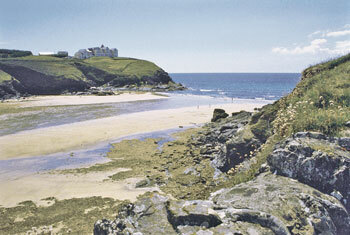 Well situated for exploring both north and south coast beaches and footpaths, Poldhu Cove (pictured) is just 3 miles away and Lizard Point is 7 miles. Helston with its shops and Flambards theme park are within 5 miles. Falmouth 11 miles. Penzance 20 miles. Eden Project 30 miles. Two bedrooms. Very comfortable sitting room with electric 'log effect' stove. Well equipped farmhouse kitchen with dining area. First floor: Double bedroom with ensuite shower room/W.C.. Twin bedded room. Bathroom/W.C. (shower attachment).